12-digit fluorescent blue display with automatic 3-digit punctuation. designed for fast and comfortable operation. Extra ease is provided by contoured Plus/Equal and Minus/Equal, frequently used Multiplication, Zero, and Plus/Equals keys are extra-large. the Grand Total function adds the grand total of several calculations such as the total prices times units on an invoice. a MU (Multiple Use) key simplifies business calculations to save time and increase efficiency by handling functions like margin, markup, selling prices, costs, percent changes. independently accessible 4-key memory, round up/off/down, definable adding mode, fixed (6,3,2,1,0)/ floating decimal, Constant and GT mode selectors, time calculation (hrs., min., sec. ), and 2-key rollover. 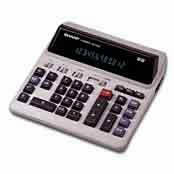 This page is part of GeneralManual.Com Network SHARP QS-2122H Commercial Calculator User Manual.